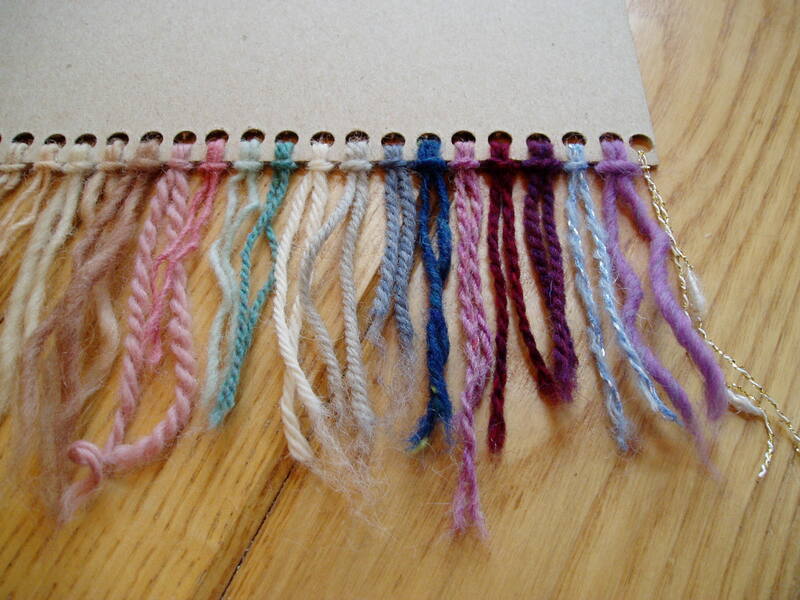 In a tapestry, the warp (usually a plain, white, sturdy yarn or cording) is the structural framework for the piece. It’s the backbone, but it doesn’t actually appear anywhere visually in the finished weaving. This is part of what sets tapestry apart from other forms of weaving–complete concealment of the warp (vertical threads) within the weft (horizontal threads). 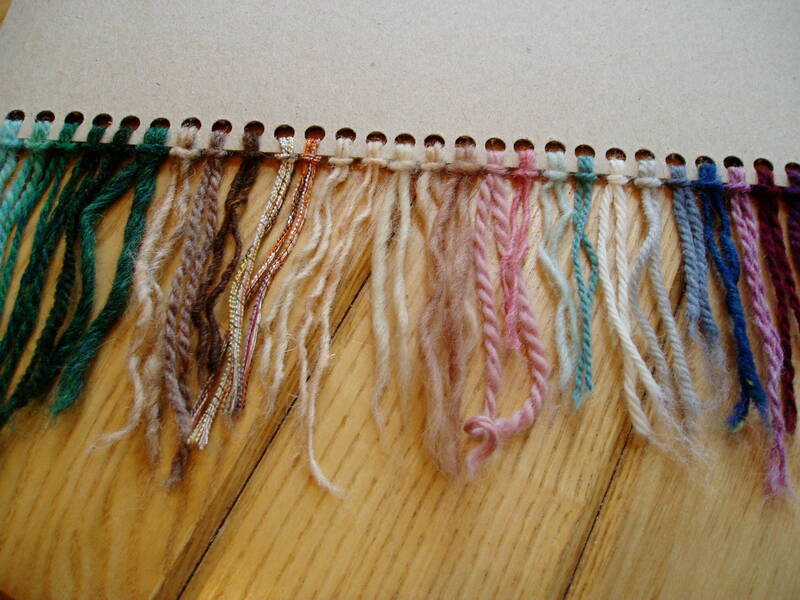 Weft threads, unlike warp, are colorful, have more body, and are less tightly spun. This is the real skin of the tapestry. It’s what people see, feel, interact with. It’s what paints the pictures, captures the light, and shares the weaver’s story or idea. While warp is like an interactive canvass in painting terms, the weft is the paints. Selecting weft threads is akin to making a palate–only instead of oils or acrylics, the medium is wool and other natural or novelty fibers. I’m always on the lookout for good weft yarns. They can be harder to find than you might imagine! One of my favorite companies is Harrissville Designs, which offers a nice array of colors with a little bit of speckle in the shades (rather than a straight, boring solid), available in larger cone quantities. For my Navajo-style works, I have grown to like Brown Sheep Company’s “Lamb’s Pride” line. The Navajo method requires a single ply weft, so the Lamb’s Pride works out quite well, with a softer feel and appearance than the traditional churro wool. For “Deceiving the Hunters,” my foremost goal was to bring out the sense of brilliance, shine, and fresh texture that the original Unicorn Tapestries would have carried when they were fresh off the loom. Soiled, battered, faded–they have carried their age quite well, but imagine what they would have looked like upon the walls new! I wanted to splash in the deep blues and lustrous reds so characteristic of tapestries of the era. The subtleties of shades of green. The glint of gold and silver thread. 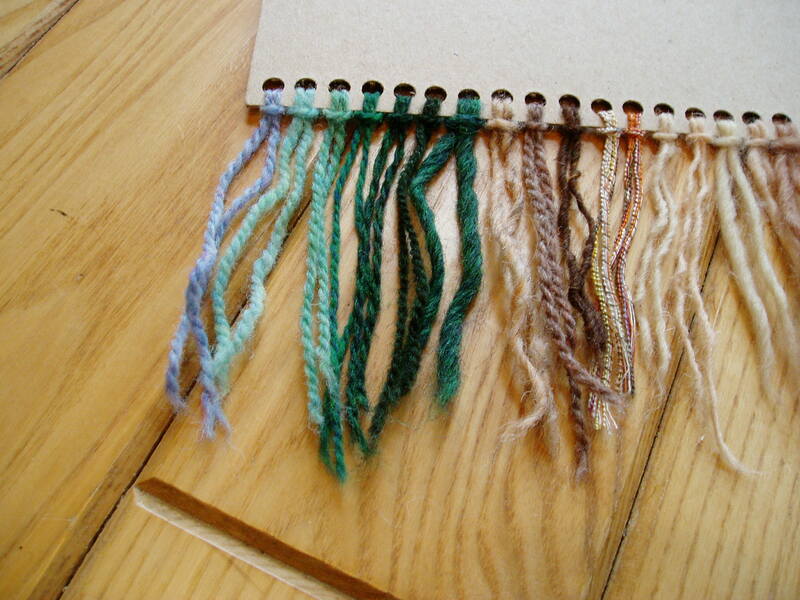 The process of collecting weft threads for this piece has spanned years (many more than the weaving has taken). From bits saved of Navajo vegetal dyed wool my teacher Fran Potter would bring to class, to interesting novelty fibers usually designed for knitters, to castaways from someone else’s project, each yarn has a unique story and reason for selection in this piece. Let’s take a moment to investigate that rabbit hole and celebrate the palate that makes “Deceiving the Hunters” possible. An all white animal, with a creamy-white horn–that doesn’t leave a whole lot to colorful imagination! But I did want to stay true to the original tones of this wonderful chimera–not adding any rainbows or fantastical elements…except to sneak in a violet eye. This adds a magical hint, instead of the natural brown eye of the original tapestries. The violet was from a wool blend I’d been using in a punched rug piece. Variagated, with flecks of gray and white, it offered several tones to use for expressing the eye, along with a deep black that was left over from the heraldic commission. For tones of mane and flank, I started with a Harrisville Designs natural white and two tones of natural gray, then added a Navajo natural gray, a Vermont handspun off-white (with an interesting, silky feel and slightly lumpy texture), an almond speckled lopi, and a soft gray two-ply from New Zealand. But these tones were all quite muted, and I wanted to create some highlights. I therefore added a silvery embroidery thread (couldn’t afford real silver gilt, and this won’t tarnish), which proved to be a real challenge for weaving! And then I found a bright white vintage nylon yarn discarded at a thrift store, which makes the mane and horn visually pop. In the original Unicorn Tapestries, the verdure has drifted towards tones of yellow or blue. This is part of the natural aging of green, with woad (blue) and madder (red) holding strongest to their colors over time and exposure to the sun. Blended colors tend to list in one direction or another over time, like a faded sign that eventually loses all hues but a denim blue beneath the sun’s intensity. So I had to imagine how the original greens might have once appeared, from the deep hues of the thicket to the shiny, waxy tones where the sun splashes upon the foremost leaves. Using an array from Harrisville Designs ranging from a light seafoam to a rich emerald, I had to find that darkest forest tone from a Wisconsin handspun I’d squirreled away in the stash left over from my very first tapestry on the Gobelin loom. A denser, bluish single-ply was a cast-off from a local charter school, where I had been teaching history and cultural studies classes. For a tapestry demonstration project with the students, one of the staff appeared with a bin of yarn, proclaiming, “If you see anything in there you like, take it! No one ever seems to use this stuff.” That fluffy teal and a lumpy gold (coming up later) subsequently came home. Three tones of brown–a deep chocolate Navajo with orange flecks, a heathery Harrisville Designs soft browns, and a sandy Navajo with flecks or brown and gray–make up branches and bark. The stiffness of the Navajo lends itself well to the texture of bark, catching the dappled light as it comes through the leaves. The “cornflower blue” of the sky was also a point of choice. In the original Unicorn Tapestries, the sky is a surprisingly brilliant blue. I decided to go with a softer tone because, while the sky is important, I didn’t want it to become a distraction for the intent of the scene. When working the colors of a tapestry that is significantly smaller than a historic inspiration, such necessity of choices can “make or break” the effectiveness of the piece as it stands alone. Selecting yarns for the lady not only demanded the most diverse array of colors and shades but also proved to be the hardest range of yarns to acquire. The skin tones alone caused considerably searching, head scratching, laying in, and taking out. 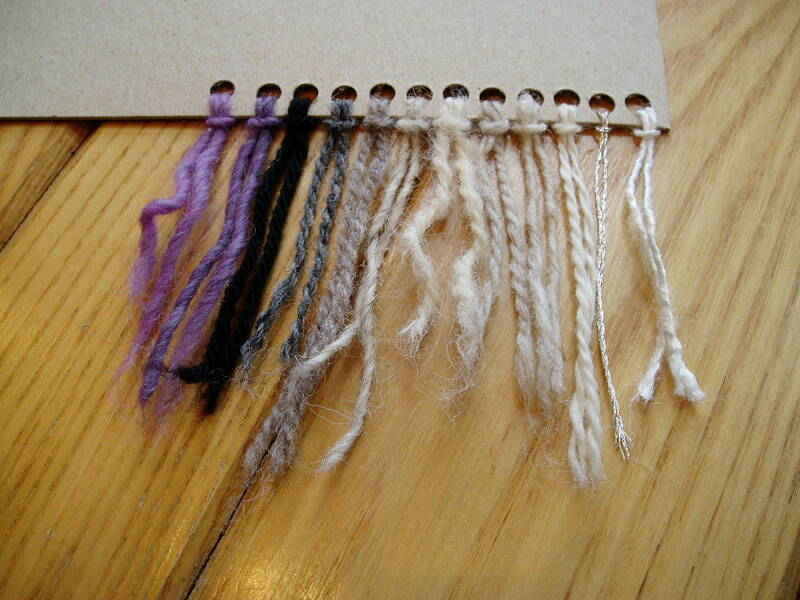 At left (following the bark colors) are two “Origami” yarns I selected for her hair. In the original Unicorn Tapestries, finer weft and closer warp spacing allows for high-detail work like hair to be formed of individual strands of weft. With my 10 dpi (warps per inch) and yarn-like weft, such details would be more clumsy. So instead of working individual strands, I found this interesting novelty yarn that is a bundle of individual strands, coiled with a black thread. I wanted the lady to be a redhead (spirited, independent, Celtic in heritage), rather than the perpetual blond of the historic tapestries, but I also wanted to catch the idea of light and sheen, waves and strands. While flecking and variegation appears already in the yarn, combining the two colors greatly added to the affect, even if these yarns fought the weaving process! Oh the joys of wool…you forget how wonderful this natural fiber is until you turn to a synthetic fiber! Then it was all the flesh tones: the hands, the face, the cheeks, the eyelids, the shading around the nose, the outlines, under the eyebrows… Starting with some Navajo vegetal dyes, I ended up having to turn to baby alpaca for the rest of the tones. 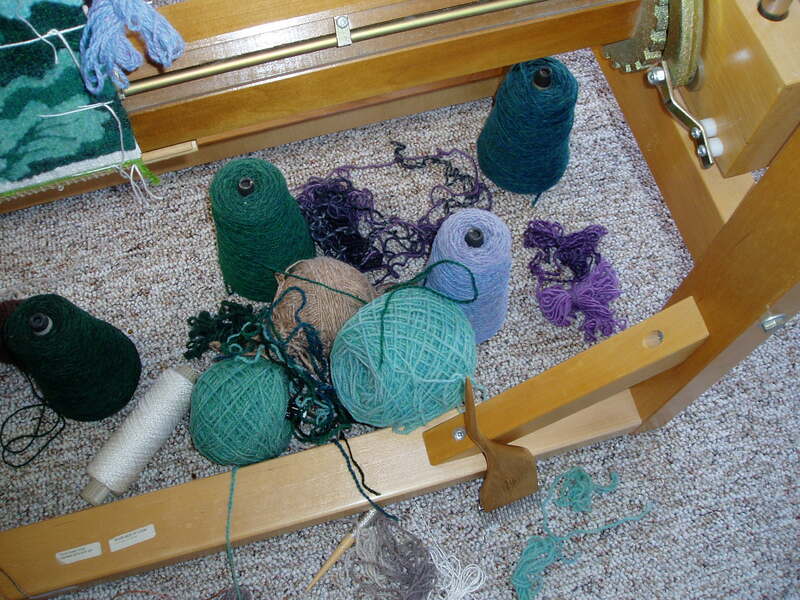 This included taking skeins of variegated yarn and breaking it where the colors appeared to be changing and arranging them in piles by hues. Some, like the fluffy two-ply pink, only appear in tiny “wavy line” rows in her cheeks–accents to add to the dimensionality of the most complex aspect of this piece: the lady’s face. The colors move onto lips and eye, with more saved bits of Navajo vegetals, along with a soft teal my grandmother gave me, left over from a knitting machine sweater she made. The fineness made the detailing in the iris possible. Oh the colors for the gown! Here’s where those classic blues and reds come to play, including a cobalt wool lopi with tiny flecks of yellow and green that was a high school graduation gift from a friend! A lovely rose and rich scarlet from Harrisville Designs are paired with a deep purple from a tiny yarn shop in Vermont to form the tones of the velvet. High contrast was crucial for creating the look of a plush fabric. Just because the gown is “red” doesn’t mean that all the colors one sees when looking at it, at its sheen and shadows, are truly red. Impressionism takes this concept much further than medieval tapestry, but it’s still key to the representative process. Then there’s the crown of jewels. Originally, I had planned to make these green, but further research noted that green jewels do not seem to make an appearance in late medieval tapestry! And, just as I was preparing to weave these jewels, I found a unique novelty yarn called “Tiara” at a shop in Colorado. Mixed with the wool and mohair, bits of sequins and glass beads had been spun into the soft blue fiber. This combination would bring a completely different texture and glint to the gems. Perfect! And the shading comes from tones in the unicorn’s eye–bringing the two together. The lumpy gold-and-white thread (also from the charter school discard pile) adds the shiny gold accents to the lady’s attire, while being quite texturally different from the smooth silver of the unicorn’s mane. In the original tapestries, gold or silver wire was wrapped around silk for the gilded weft, so I imagined that sometimes the silk might want to peak out as well, hence the white bits felt right to me. This was also a tricky weft to choose and involved two to three times as many rows to fill in the same space as one row of wool. Tedious, but so worth it for the shimmering effect. Remnants, discoveries, breakthroughs, compromises, all are part of the process of developing this tapestry’s palate. Devotion to the originals yet divergence from them in choices of colors and fiber types also parallels the story being told in the imagery. The alternative narrative of “Deceiving the Hunters” trickles down to the very yarns involved. It’s part of what makes this medium so endlessly magical for me. Start with a pile of yarn–end up with a textured painting that can be experienced with the fingers as well as the eyes.